Dennis Yu did not focus a lot on the Blitz Metrics information I just shared, but that was okay with me. He let us in on some of what is going on behind the scenes of Facebook and options that aren’t so well known. I had no idea all of the things that Facebook could do for targeting audiences and advertising. Yu introduced us to graph search on Facebook, which is available to everyone, but none of us had checked it out yet. I officially think graph search is awesome. It allows you to narrow down to such a specific audience, so specific I didn’t even think you could be that specific. He showed us an example of this by searching for friends of our professor (Dr. Freberg), who are 40 years old and like ice cream, but no results were found. He let us know that this does happen and you can be too specific sometimes but you just have to try and if it does happen, just take the last characteristic you added off. There is a couple of other things that don’t go directly with the topics I’ve just discussed that Yu told us about but they were just so interesting I had to share them with you all. Yu got to have lunch with Mark Zuckerberg! How many people can say they get a call to have lunch with Mark Zuckerberg? Okay, it’s probably more than I think, but still that’s just awesome. Another thing is that with any other social media site you cannot go as in depth into data as you can with Facebook, because they just don’t the amount Facebook has. Also, a really random fact is that if Nike is your client, you cannot let it be known that Nike is your client. I was floored by that information as well-known as the brand is. 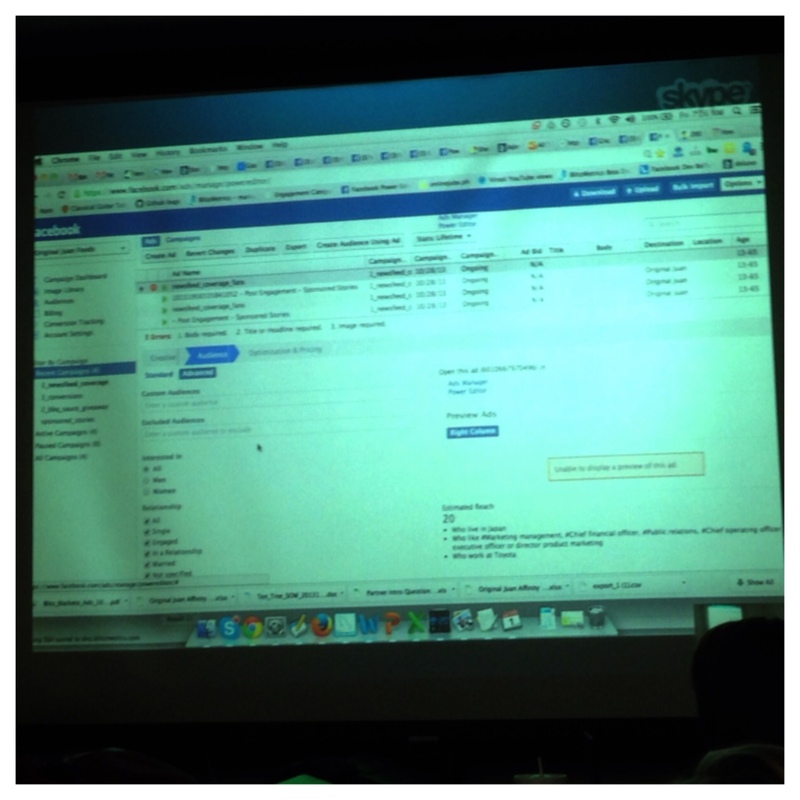 Probably the coolest thing that Yu showed us was that everyone on Facebook as an i.d. number and through that number it can be determined how long you’ve been on Facebook. If you remove the www from a person’s Facebook account and simply put in their i.d. number their account will still come up too! Also, you would think Mark Zuckerberg would have the very first Facebook account, but he doesn’t, he is actually account four and accounts one through three just don’t exist. Needless to say I learned an awful lot from this guest lecture! Thank you to Dennis Yu and Dr. Freberg! Follow them both on Twitter at: @kfreberg and @dennisyu.